At the annual Ducks Unlimited banquet, Oct. 10, at Crowne Plaza hotel in Wyomissing, D/U president, Doug Shade, a long-time mentor of Roger’s, presented Roger and Bob with the Bernie Elzer, Jr. Conservation Award citing the duo’s radio, TV and newspaper coverage of the Berks County outdoors community and their sponsorship of Hunters Fighting Hunger, Big Brothers and Sisters, Berks Outdoor Sportsperson of the Year and other educational and conservation efforts during the past 25 years. 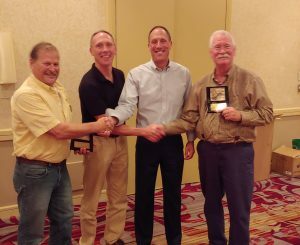 The award was personally presented by Elzer’s sons, Bob and Bernie III. “We are proud and humbled by this award. Thank you. ” –Roger and Bob.